That figure comes from The New York Times’s coverage of the cage-free announcement. The paper reports that “it could take McDonald’s as long as 10 years to reach its goal of having 100 percent come from hens in what are known as ‘aviary systems.’” Aviary systems should not be confused with free range situations. They’re simply cages with room for chickens to run around and nest and hang out and stuff. 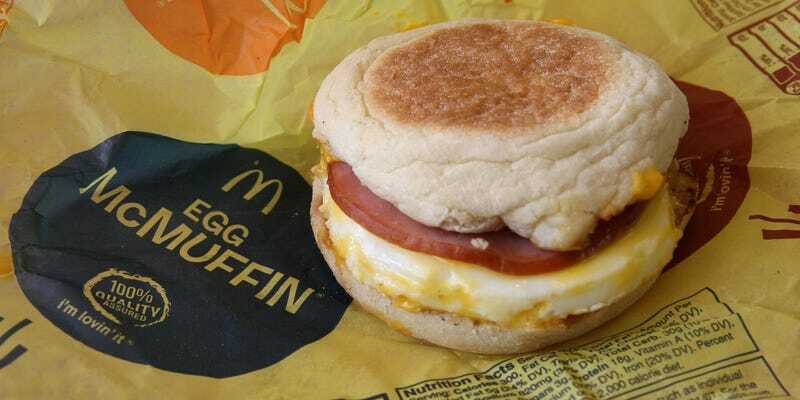 So don’t expect to start feeling better about scarfing that Egg McMuffin any time too soon. The good news is that McDonald’s is a big enough force that its move to eggs from cage-free hens will put the pressure on many others to follow suit. Burger King actually beat its competitor to the punch and says it will complete the transition by 2017. The cage-free news comes just a week after McDonald’s announced that it will start serving breakfast all day in the U.S. That surely means that the fast food restaurants will buy even more eggs in the years to come. And again, when McDonald’s buys more of something, it don’t buy thousands. It buys billions.